The UK government insists Theresa May's Brexit proposal is a "workable, credible" deal, despite being rejected by EU leaders at a summit in Salzburg. Minister James Brokenshire said "tough words" were to be expected near the end of negotiations but the government was "resolute" in its bid to get a deal. He said the so-called Chequers plan "does deliver" and it was now for the EU to "be specific" about its concerns. Prime Minister Theresa May says her plan for the UK and EU to share a "common rulebook" for goods, but not services, is the only credible way to avoid a hard border between Northern Ireland and the Republic of Ireland. Katya Adler: What just happened in Salzburg? But it is opposed by some within her own party who argue it would compromise the UK's sovereignty, and got a cool reception at this week's EU summit in Salzburg, Austria. Mrs May described her talks there with European Council President Donald Tusk as "frank". In a news conference, Mr Tusk said that while there were some "positive elements" in the Chequers plan, EU leaders had agreed that the proposals needed to be redrawn: "The suggested framework for economic co-operation will not work, not least because it is undermining the single market." He followed it up by posting a photograph on Instagram of he and Mrs May looking at cakes with the caption: "A piece of cake, perhaps? Sorry, no cherries." On Friday, Communities Secretary Mr Brokenshire, a former Northern Ireland Secretary, told BBC Radio 4's Today programme: "The Chequers deal is a workable, credible deal to meet our ambitions. "They [the EU] have said that it's about the integrity of the single market and we believe the Chequers deal responds to that, and it's for the EU to engage with what's on the table." But former cabinet minister Iain Duncan Smith, who campaigned for Brexit, questioned why the UK had gone for a plan which "was so obviously not going to cut the mustard with the EU". He added that the EU had "behaved appallingly" towards Mrs May and he described Mr Tusk's Instagram photograph as "quite insulting". The UK and EU are trying to reach a deal in time and want to avoid a hard border - physical infrastructure like cameras or guard posts - between Northern Ireland and the Irish Republic but cannot agree on how. The EU insists on its own "legally binding Irish backstop" - what it describes as an insurance policy to prevent a hard border, if no other solution can be found. Theresa May and her government have been trying to pursue a middle way, to find a stance between the basic options - a close "Norway style", or free trade deal roughly like Canada. 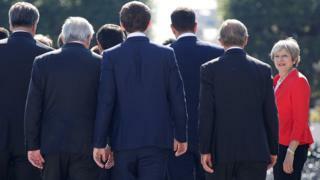 Sources on the EU side express irritation at the UK's approach, at what they see as the strident tone the prime minister took in the last 48 hours. The European Council is not the same as Prime Minister's Questions, it's suggested. But to kick out publicly as they did in Salzburg certainly runs the risk of pushing Mrs May too far. It suggests Northern Ireland should stay aligned with the EU in key areas, in effect staying in the customs union and single market. But the UK says this is unacceptable as it would split Northern Ireland from the rest of the UK. 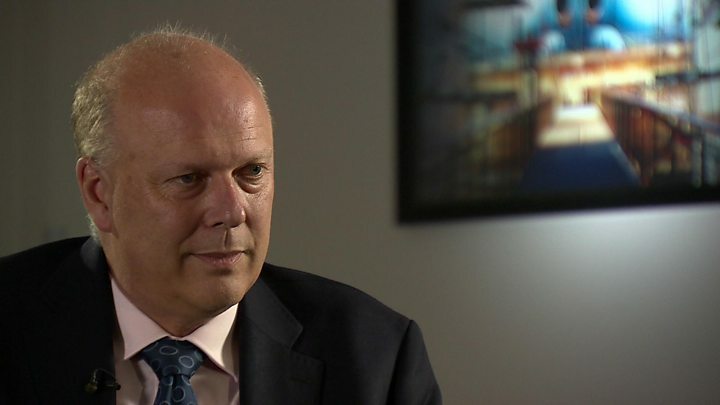 Transport Secretary Chris Grayling told BBC Newsnight: "At the moment what the European Union is asking in and around Northern Ireland is simply impossible for any UK government to accept. And actually if they stick with that position, there will be no deal." Mrs May has said the UK will come forward "shortly" with new proposals on the so-called "backstop" arrangements, but also insisted Chequers was the "only serious and credible proposition" for an overall deal. Scotland's First Minister Nicola Sturgeon tweeted: "Now that the EU has explicitly rejected it, the Chequers pretence has to stop. "At the very least, single market/customs union membership must be back on the table and the Article 50 clock [the time-limited process taking Britain out of the EU] must be stopped to avoid a cliff edge." Shadow Brexit secretary Sir Keir Starmer told the BBC that if the negotiations ended without a deal, it "would be catastrophic for our economy, plunging it into real crisis". "Really, the next few weeks should be all about how does the prime minister avoid that," he told the BBC. "She needs to accept that we need a customs union and a strong single market deal, both for the Northern Ireland border and for our economy." Leading Conservative Remainer Dominic Grieve said he believed a deal would be offered but one that would be "very difficult" for the UK to accept - "which is why we are going to have to reconsider what we are doing". He said the EU could only show limited flexibility towards a non-member: "We are asking for something that the EU, as an international treaty organisation, cannot readily give us." Mr Tusk said on Thursday that October would be the "moment of truth" for reaching a deal, and that "if the conditions are there" an additional summit would be held in November to "formalise" it. Meanwhile, pro-European Scottish politicians seeking a ruling on whether Brexit can be halted have been given permission to take their case to Europe's highest court. The cross-party group of politicians argue that Article 50 can be revoked if MPs vote to do so. They won an appeal at the Court of Session in Edinburgh, Scotland's highest court, and the European Court of Justice will be asked to give a definitive ruling.